Students from year 13 set up their own group, Cheney FGM Awareness and have created their own initiatives as well as working alongside Oxford Against Cutting. On International Day of Zero Tolerance for Female Genital Mutilation, 6 February 2015, Cheney FGM Awareness ran a speaker panel event in the Assembly Hall at Cheney School. The guest speakers were young people from another anti-FGM group, Integrate Bristol. The audience were asked to make comments about changes that need to happen on yellow paper flowers and the comments evidenced a strong drive for further action in schools. One student was photographed by the Oxford Mail holding a flower and the article was spotted by Baroness Northover who asked to meet her! Members of Cheney FGM Awareness attended the Integrate Bristol conference the following day to learn about how FGM can be taught in primary and secondary schools. Anti-FGM champions from Cheney School took part in Oxford Against Cutting’s schools booklet project. 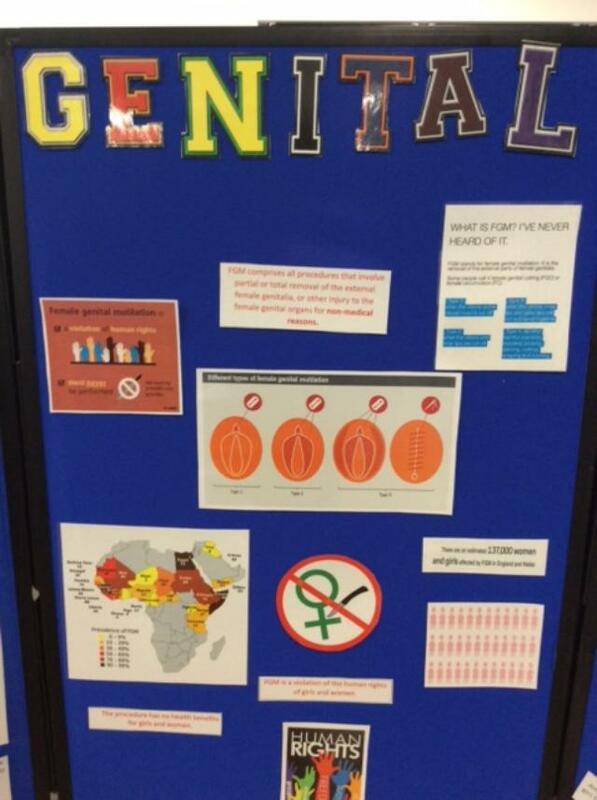 Students from year 12 and year 13 formed a committee with students from Cherwell School to create a booklet about female genital mutilation. The booklet will help professionals start conversations with girls at risk of FGM. During the project, the students attended a series of workshops to learn about FGM and campaigning skills and create the booklet. They wrote the text for the booklet and ran an art competition, setting the criteria, deciding on the themes and judging the final artwork. During the schools booklet project, some students from Cheney School ran their own art workshop to help raise awareness about FGM and encourage year 7 students to get involved with the competition. The workshop focused on rights that affect the human body and students created cut out people of themselves with messages to understand positive body image. The artwork from the competition was displayed at an exhibition at The North Wall Arts Centre in Summertown, alongside the work of professional artist, Jeroo Roy. The exhibition ran from 27 May until 12 June 2015. Cheney students helped with the speaker event to open the exhibition on 27 May. 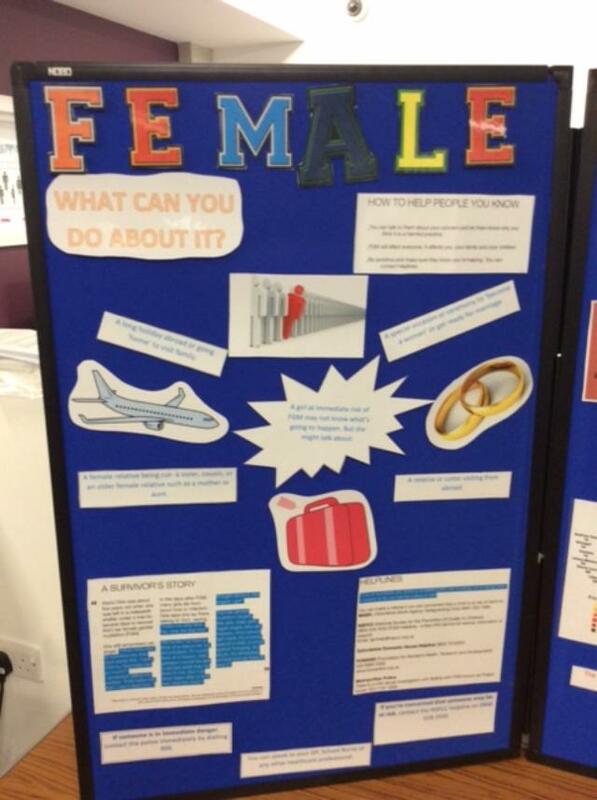 The Cheney team also joined Cherwell School students in presenting at a high-profile conference about FGM sponsored by the Department of Health, in Oxford on 19 March 2015. The young team explained how professionals and peers can use the booklet about FGM they have created, showed the audience some of the winning artwork from the anti-FGM art competition and talked about the feelings of a survivor of FGM. The conference was attended by some 220 people. Clare Robertson, Consultant Community Paediatrician and an anti-FGM strategy lead in Oxford said “It was a brilliant way to end the day and very powerful to see young people being such effective anti-FGM Champions”. Two students from year 13 joined Oxford Against Cutting (OAC) as trustees. Kate Agha, Executive Director of OAC said “Young people are naturally brilliant and we need young anti-FGM champions in every school to help end FGM in a generation. Our youngest trustees are inspirational in their drive and creativity to tackle FGM. We are very lucky to have them on the team”. The Cheney team also helped raise awareness when one student organised a 6 hour “lie in” in the Lush shop window in Oxford whilst she was decorated in henna. During the event, the team talked to members of the public about positive cultural traditions, such as henna, and negative cultural practices, such as FGM. Nia from the Cheney team was spotted in the press by Baroness Northover who was so impressed by her anti-FGM campaigning that she requested a meeting. Read her thank you letter here. 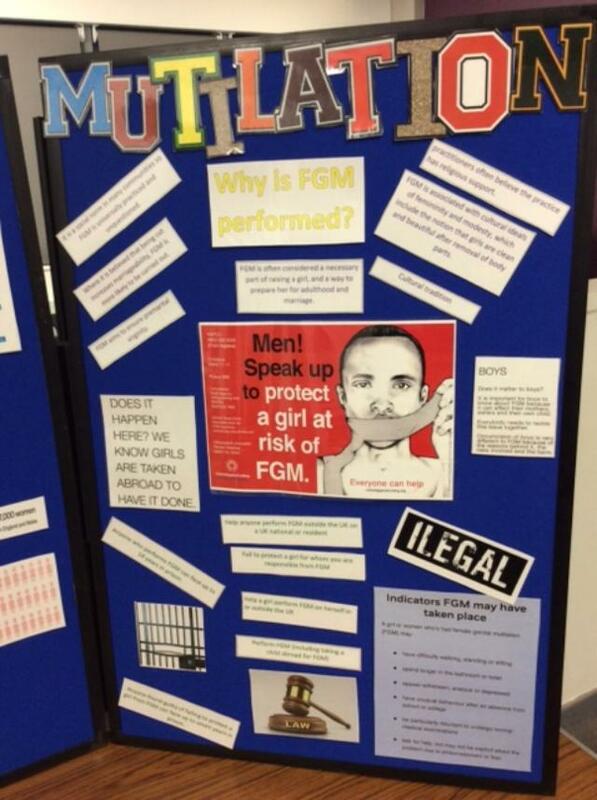 Cheney School created a display to mark Zero Tolerance for FGM Day on 6 February 2018. Student Children’s Nurse, Emily Bessant, and Sue Bolton, School Health Nurse, put the display together. The display will stand in the Year 11 area for a week and then go in the other year areas after half term. It includes what FGM is, prevalence, why it happens, the law, what are the signs that it may be happening or has happened, what an individual can do about it, where to access support, a survivor’s story, and what boys / men can do about it. In June 2017 Oxford Against Cutting delivered anti-FGM lessons for 80 girls in Year 10 as part of Cheney’s Make a Change Day. The school is planning awareness training with year 11 boys later in the year so will soon have an entire year group of young anti-FGM champions!